Below is a discussion of figures from Chapter 5 of the Foresight Africa 2017 report, which explores six overarching themes that provide opportunities for Africa to overcome its obstacles and spur inclusive growth. Read the full chapter on confronting climate change here. As Africa continues to urbanize at rapid rates—due largely to natural increase of urban populations and also (less significantly) to climate-induced rural-urban migration—many countries across the continent are striving to take advantage of the economic opportunities presented by urban growth. These possibilities include increasing agricultural productivity by connecting rural economic activities to urban markets; fostering industrialization as firms cluster and realize economies of scale; strengthening services sectors through skills development of urban labor forces; and attracting more foreign direct investment in urban corridors. At the same time, climate change and urbanization present a number of challenges to development in some cities, heightening environmental risks and degradation. When cities become more populated, crowded, congested, and industrialized, levels of pollution can increase, exposing residents to poor air quality levels. For example, the 2016 African Economic Outlook report stated that the human cost of air pollution is “abnormally high” in Africa, where an estimated 246,000 premature deaths in 2013 were caused by ambient particulate matter pollution. The report also highlighted certain policies that can help curb pollution, including environmental protection acts targeting the transport sector—vehicle fuel parameters, the phase-out of lead from gasoline, emission standards, and air quality controls. Still, it noted that only eight countries in Africa have operational routine monitoring systems for air quality, limiting the measurement of pollution levels and enforcement of standards violations. 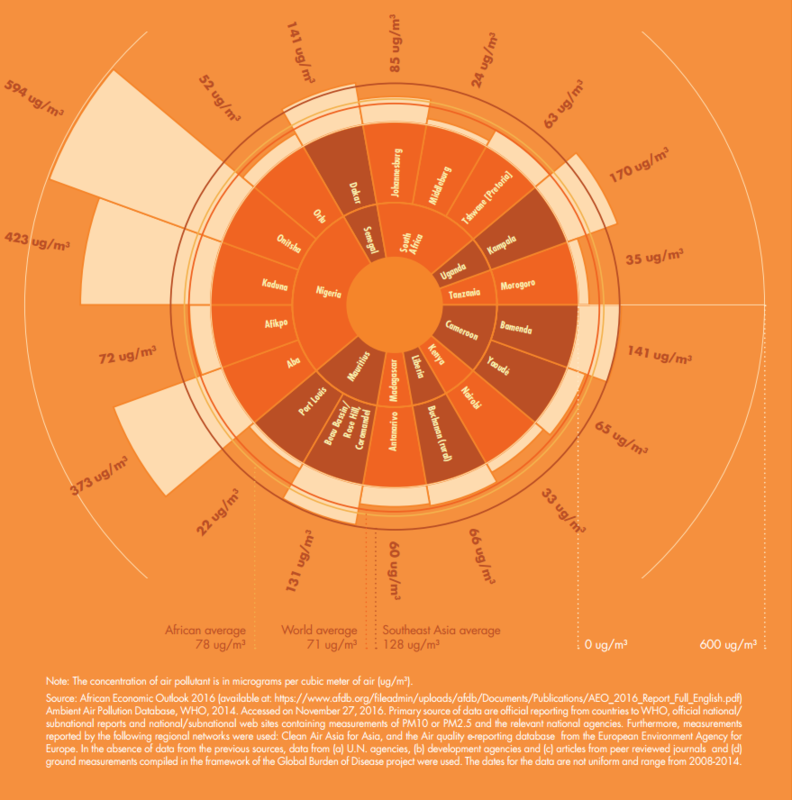 Figure 1 below, from this year’s Foresight Africa report, illustrates the varying mean concentrations of particulate matter smaller than 10 microns in diameter—a common measure of pollution levels—of African cities compared to regional, global, and Southeast Asian averages. It indicates that the average African city has slightly higher levels of pollution than cities globally, however, on average, African levels of urban pollution remain below those of similarly developing Southeast Asian cities. Interestingly, population size does not necessarily determine pollution levels, as Kenya’s Nairobi has a larger urban population (3.14 million people) and lower pollution levels than Uganda’s Kampala with a population of 1.6 million.